> Blog > Uncategorized > Do you want flies with that? A single pest presence is all it takes to ruin your reputation in the food service business. Not to mention the hassle it can be when you fail an inspection due to their presence. Restaurants are an ideal location for pests to thrive, but with these 5 tips your restaurant won’t be one of them! Cleanliness is important in every aspect of food service, including where you throw your trash. Dumpsters are a common site for pests providing an ideal feeding ground for them to thrive. Many businesses neglect to clean their dumpsters and the area around them increasing your risk of an infestation. Be sure your dumpster is located away from your main building and that the lid(s) shut tightly to prevent pests from making themselves at home. Doors and windows are the perfect way for pests to sneak in undetected. When possible, both should remain closed. Receiving areas, drive thru windows and primary entrances are opened frequently and often for long periods of time making them an ideal spot for pests to sneak in. Keep an eye out for cracks in the buildings foundation, and even the smallest crevice. Insects and rodents alike are resourceful and sneaky when they are looking for a new place to call home. Tables and chairs in the dining area should be wiped down after each party has left. Cleaning the area under the table should also take place after each meal to remove any crumbs or pieces of food left behind. Without any left-over food laying around to feast on, pests that enter your restaurant will be encouraged to leave. In the food prep area, keep your eyes open for crumbs, and drips on and around tables, equipment and appliances. Loosely closed bags and boxes full of dry food products are a dream come true for pests. Use tightly sealed food storage containers, placed at least 6” off the ground and 12” away from a wall to minimize your risk of infestation and keep the area clear for easy observation. If you have some products that are less commonly used, be sure to check regularly for the presence of pests. All it takes is one pest, in the right environment to create an infestation. Many restaurant owners don’t think of it, but drains in both the sink and floor are some of the dirtiest places in your business. Be sure to focus attention on cleaning the drains regularly, as they are the perfect breeding ground for many insects. With food scraps for nutrition, and a warm and moist environment it doesn’t take long for pests to multiply. 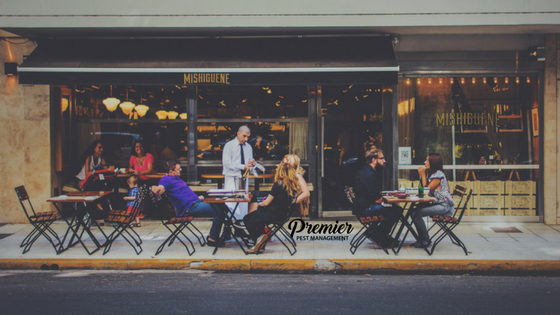 Premier Pest Management knows the importance of providing confidential, and reliable service to the food service industry. To learn more about how we can help you protect your business from an infestation, contact us today.